GPS signals have to be transferred from the antenna to a control room in mobile networks architecture. Sometimes, the physical distances are more than a few kilometers which eliminates the use of coax cable due to high loss. The shortage of fiber forces mobile companies to use the same infrastructure for GPS and digital signals using WDM technologies. Programmable 2.5 GHz RF Over Fiber allows signals to be carried from an antenna to a GPS receiver over fiber with minimal signal degradation. It enables transfers at low signal levels, e.g., from the antenna to the network in case of GPS. 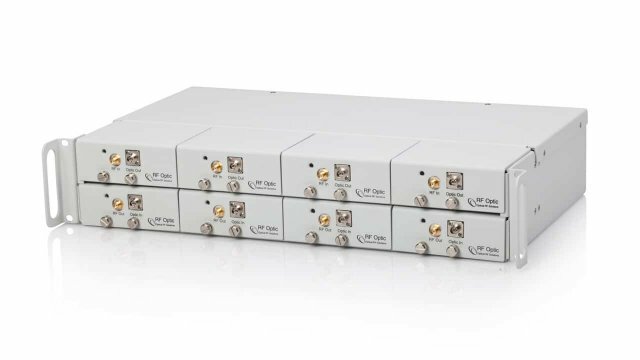 The RFoF links are designed to offer a low noise figure by integrating a built-in LNA in the transmitter and post amplifier in the receiver for low level signals. A built-in bias T is also available. The module is offered as RFoF in a compact aluminum case for indoor and outdoor applications. The RFoF modules have a relatively high gain (about 40dB) with excellent gain flatness, and a low noise figure (thanks to an integrated LNA in the transmitter), and high SFDR. In addition, the power consumption is relatively low. The standard optical connector is FC/APC, with SC/APC being available upon request.